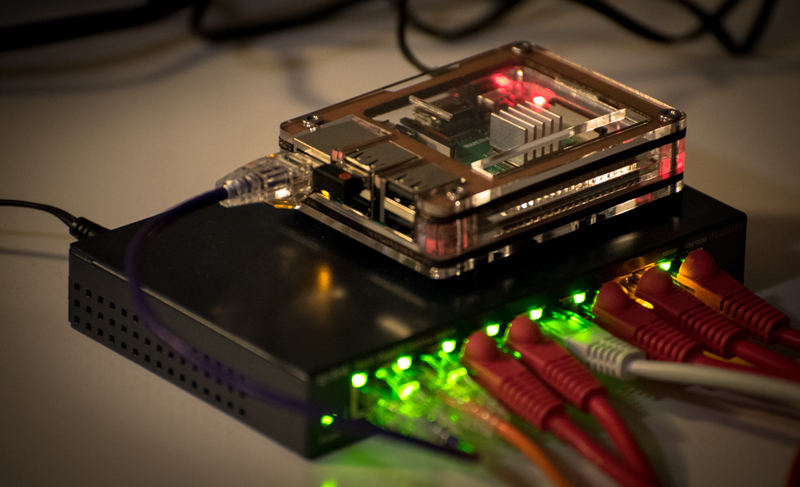 As I’ve mentioned in previous posts, I’m working on build a Kubernetes cluster out of Raspberry Pis. One of my design goals for the cluster is for it to be modular and separate from my home WiFi network. To do this, I’ve decided to take one of the Pis and make it into a jumpbox for accessing the cluster and a router that grants the cluster Pis access to the internet. 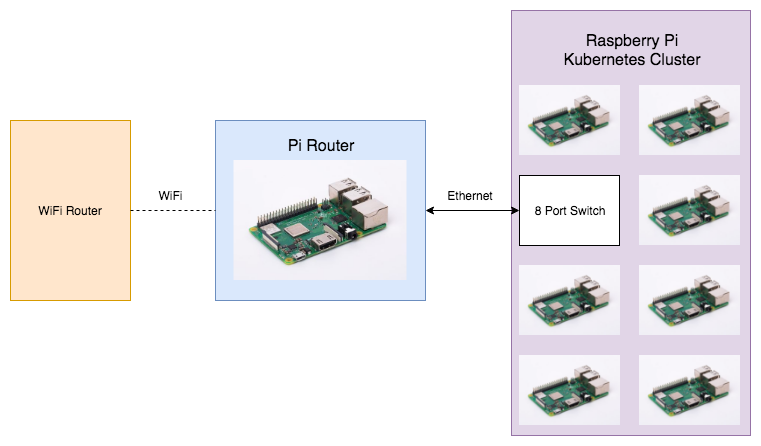 Plan is for it to look somewhat like the diagram below, with the Pi Router connected to my regular home router over WiFi and connected to the Pi Cluster’s 8-port switch over ethernet. I tried following other guides on the internet (particularly ones trying to do the opposite and configure wlan0 to be a wireless access point) and had some issues. Turns out things change in Raspbian and some configuration options are no longer valid. So my goal with this post is to be less of an exact “step by step” guide and more of a trail of breadcrumbs to provide some general guidance – and help me remember what I did when this Pi inevitably dies. I assume if you’ve stumbled upon this post that you probably have all the equipment that you need, but I figured it wouldn’t hurt to mention the relevant equipment I used. The gigabit switch is probably overkill for this project since the Pis can’t network nearly that fast – could have also done with Cat5 cable all around – but the reviews were good and the prices were right. So now that that’s out of the way, let’s get in to how I transformed this Raspberry Pi and pile of cables into a functioning router for my Pi Kubernetes cluster. I used etcher.io to burn the image to my microSD card and added a ssh file to the root directory of the card to enable ssh with the pi user. After installing, I used plugged the Pi into my TV and used the GUI to connect it to my home WiFi network. I then changed the hostname to be on theme and pi user’s password to be a little more secure. Looked up the MAC address for the wlan0 network device. Logged in to my home router’s admin portal (for me this was at 192.168.1.1) and reserved a static IP address for this MAC address. For my NETGEAR router I followed these instructions and assigned it 192.168.1.100. Now that the Pi Router was connected to my home network, I was able to ssh on to it at the address I gave it. Job for dhcpcd.service failed because the control process exited with error code. See "systemctl status dhcpcd.service" and "journalctl -xe" for details. They mainly were concerned with the wlan0 wireless access point use case, but I adapted the information in them for our situation. The secret was to add the following to our /etc/dhcpcd.conf file. This file configures our dhcp client daemon (more info here). If you’re interested in even more information about dhcpcd.conf, I recommend reading these Ubuntu docs. This told it to give the eth0 interface a static IP address of 10.0.0.1/8 on the internal 10.0.0.0 network which the Pis in the Kubernetes cluster will be on. I also added the nolink option to get it to set up the interface without it necessarily being attached to the cluster. Next we’ll install dnsmasq to be our DNS/DHCP server for the cluster. # a jumpbox it is nice to give some wiggle-room. # This would make it easier for tunneling, certs, etc. So I intially had issues with getting dnsmasq to boot up so I found the log-queries and log-dhcp options helpful. They log out to /var/log/syslog by default on Raspbian, but you’ll want to disable them once you get everything working to put less stress on the SD card. -- Unit dnsmasq.service has begun starting up. Jul 01 21:20:56 porter dnsmasq: dnsmasq: syntax check OK.
Jul 01 21:20:56 porter systemd: Failed to start dnsmasq - A lightweight DHCP and caching DNS server. Notable changes to /etc/init.d/dnsmasq above were the hacky sleep 10 and the addition of $dhcpcd to the “Required-Start” section. I wanted the Pis in my cluster to be able to access the outside internet, so the next step was to set up some internet forwarding! After all of this I did a sudo reboot again and sshed in again. I executed a few curl commands (e.g. curl http://example.com) to confirm that they had internet access and everything worked wonderfully! Additionally, from within blathers I was able to ssh pi@nook to confirm that the clustered Pis could communicate with each other. As I mentioned earlier, the editing /etc/network/interfaces did not work at all for me. My understanding is that it used to work in older versions of Raspbian, but no longer works correctly in Raspbian stretch. Additionally, I had trouble around dnsmasq coming up before 10.0.0.1 was available for it to bind to. Adding a sleep to its init script “fixed” this, but it feels hacky. Still on the hunt for a better solution here. Like I mentioned earlier, these steps worked for me for my particular version of Raspbian stretch and hardware configuration. As I personally found from past guides, these steps may not continue to work. The gist of things should remain the same, however, so with some skilled Binging I’m sure you’ll get your Pi router working as well. Best of luck!